There could be many reasons why your website performance is poor, one of them can possibly be that Apache is not coping with the load. 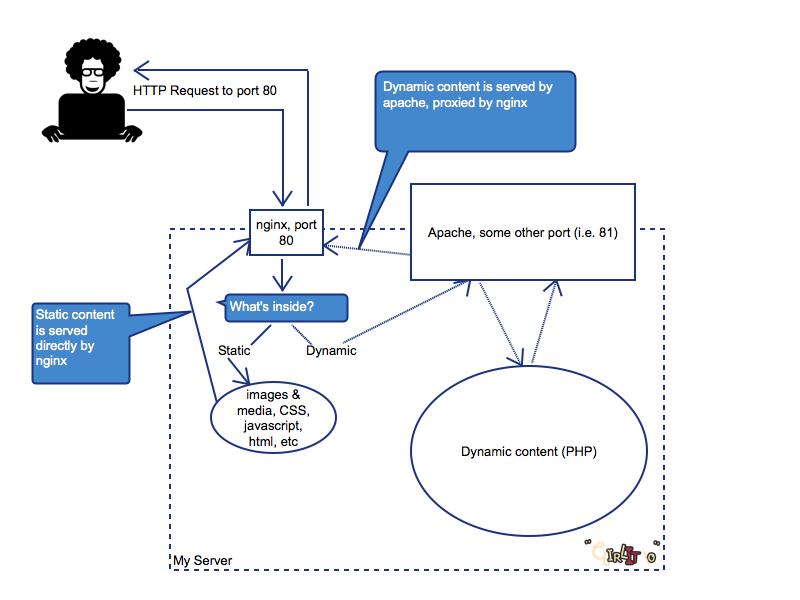 There is a simple way to offload Apache by configuring nginx to serve static content. Of course it is possible to configure nginx to serve static content not only for Drupal sites, but below nginx config files are Drupal-specific. You can use this configuration for the case you host only one site on your server/VPS and also for the case when there are several websites (domains) on this server (which can be configured as virtual hosts on Apache level). If you are using Virtual Hosts, the port should be changed there as well. 80 should be changed to 81 in all the above examples. worker_processes 8; #one process per CPU, so if your server has 8 CPUs, write 8 here. sites-enabled/00-nginx-default – default server, this configuration will be used in case current domain does not match specific domains. Using this configuration nginx will pass ALL requests to Apache, doing basically nothing. It can be useful, if for example you’d like to install phpmyadmin or some other tools on a different domain/subdomain for security purposes and easier administration (which means that there won’t be big load passing through this configuration). So, in case you have more than one site running on the server, you’ll have to create a separate configuration file for every site (otherwise all of them will go to 00-default-nginx and it won’t bring any value, just on the contrary – additional layer when delivering content). – that usually goes in nginx.conf file. If you have more than one site running on one server, then separate error.log can be configured for every site, the configuration is done for each domain separately. If a domain does not have personal configuration, the main one (from nginx.conf) is applied.